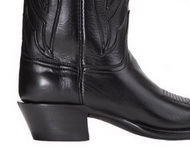 Traditional cowboy boots have nearly always been made with a smooth leather sole with a stacked leather heel. 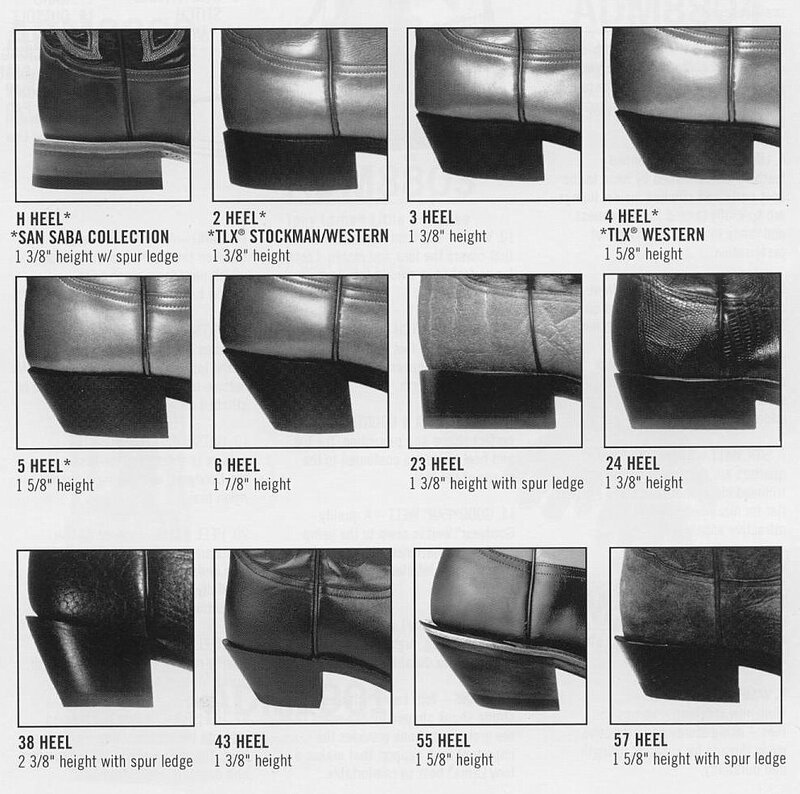 This heel-sole combination was (and still is) the best for riding horses with feet in the stirrups. 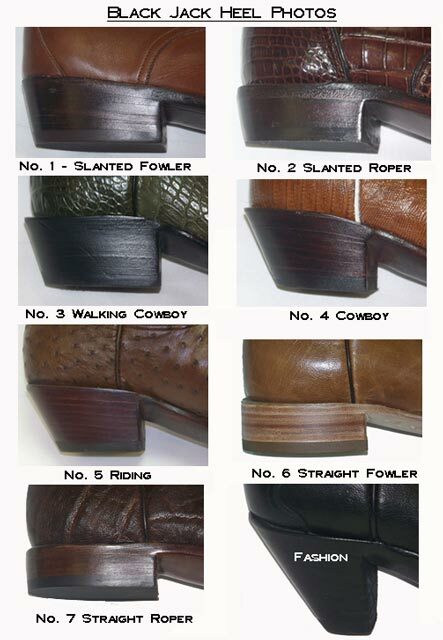 The majority of folks who wear cowboy boots today rarely mount a horse, however, which has led to the availability of many other types of Western boot soles and heels. 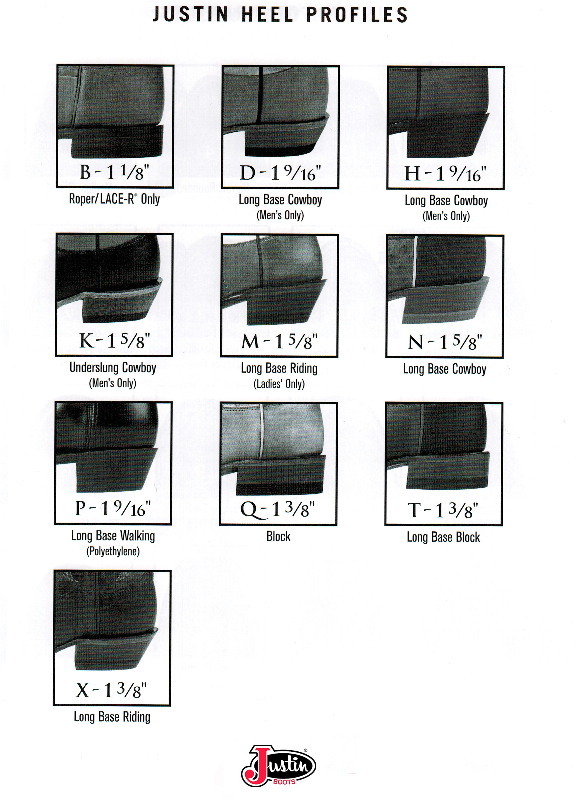 Smooth natural leather is best for riding, and also great for line dancing. Anti-slip rubber outsoles with tread, often found on roper-style boots, are great for working or lots of walking. 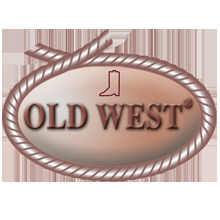 Oil-resistant rubber soles are available in some work-Western boots. 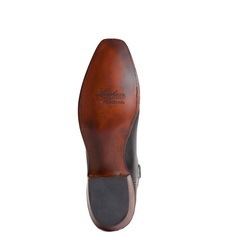 A nice compromise for a Western boot sole is a smooth leather outsole with a rubber-capped heel, providing a small non-slip surface but still allowing for easy movement in and out of stirrups or across the dance floor. 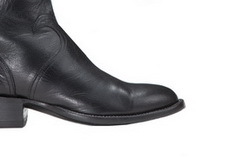 Many modern Western boots include a midsole and/ or footbed. This inner layer may be made from materials like spongy synthetic EVA or natural cork, and is designed to cushion the bottom of your foot. Shock absorption and cushioning is especially important if you’ll be walking or standing a lot in your boots. If you want truly handcrafted Western boots, look for boots with outsoles that are considered hand-rolled and hand-pegged. 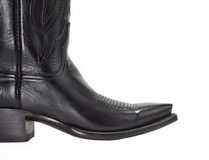 All Western boot outsoles have a convex curve at the arch to match the shape of a person’s foot. While many modern boot outsoles are rolled by machine to achieve this curved shape, the curve is fashioned by hand in some high-quality boots and secured in place with wooden or brass pegs driven by hand. 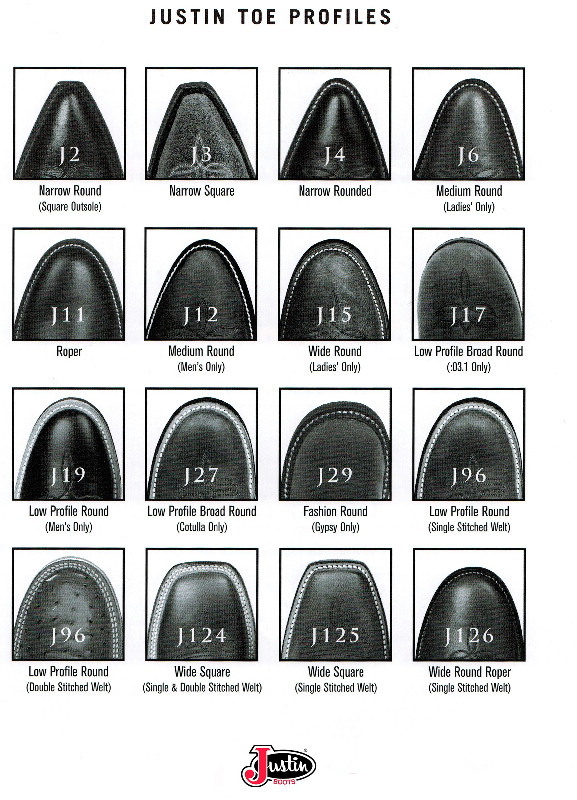 Choosing the shape of the toe on a pair of new boots is a challenge for many buyers. 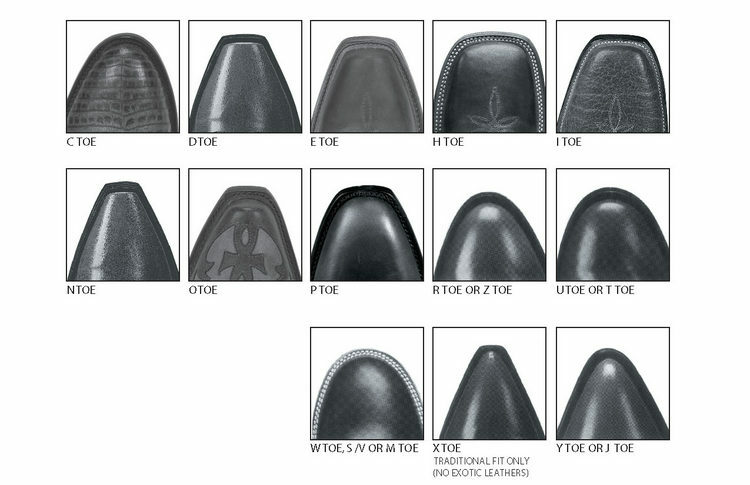 The shape names assigned for the toe styles can vary from manufacturer to manufacturer. A “J toe” in one brand could be an “X toe” in another brand. This lack of codification can be very confusing! 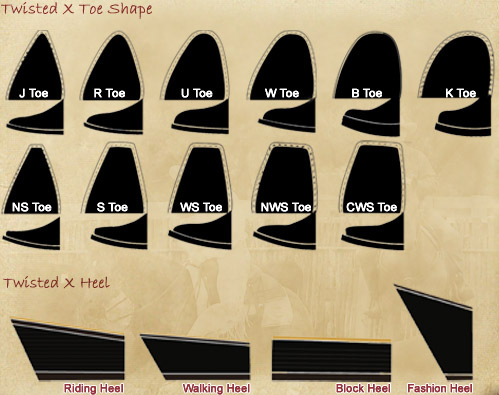 While I can’t give the complete toe-shape charts of every major cowboy boot brand on this blog post (as many brands lack this kind of diagram), I can give a little insight into the most popular shapes of toes available. 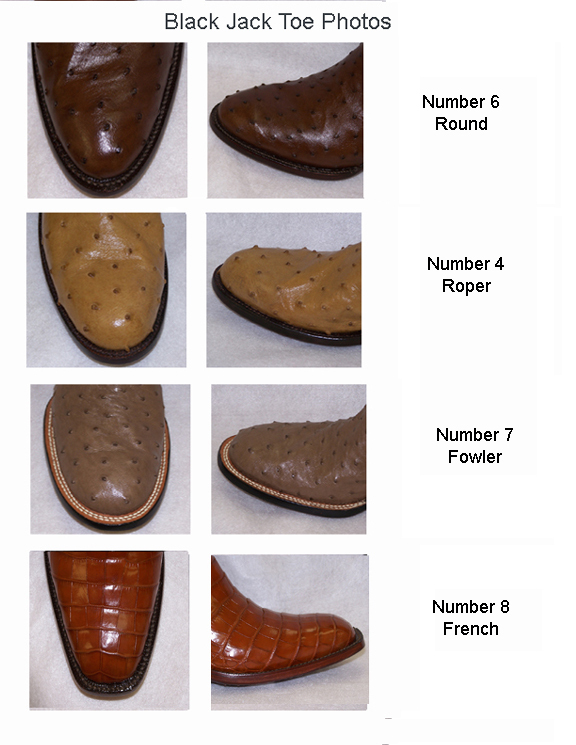 We’ll go with generic names like “round toe” or “extra pointy toe” rather than the brand-specific names that cowboy boot manufacturers create. 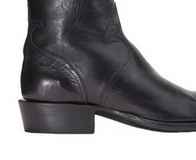 CLASSIC: The true shape of a classic cowboy boot toe is a subject that gets cowboy boot enthusiasts fired up. Some people swear that the boots with the extra pointy toes we’ve been seeing for several years are the most authentic. Others say rounded toes make the most sense. To clear things up, both parties are right (kind of). 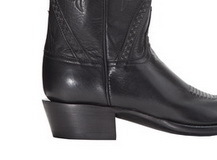 Real, classic cowboy boots feature a toe that is tapered (i.e. smaller towards the tip), but also rounded. The shape of this toe let the cowboy of the old west easily slip his foot in and out of the stirrups. The rounded toe was just a little more practical than the extreme point. POINTED: Pointed toe cowboy boots have been popular since at least the 1950s, but have been particularly prominent in modern fashion since the early 2000s. Pointed toes can be “needle pointed” (come to a sharp point), or can be slightly blunted (snipped) at the end of the toe. 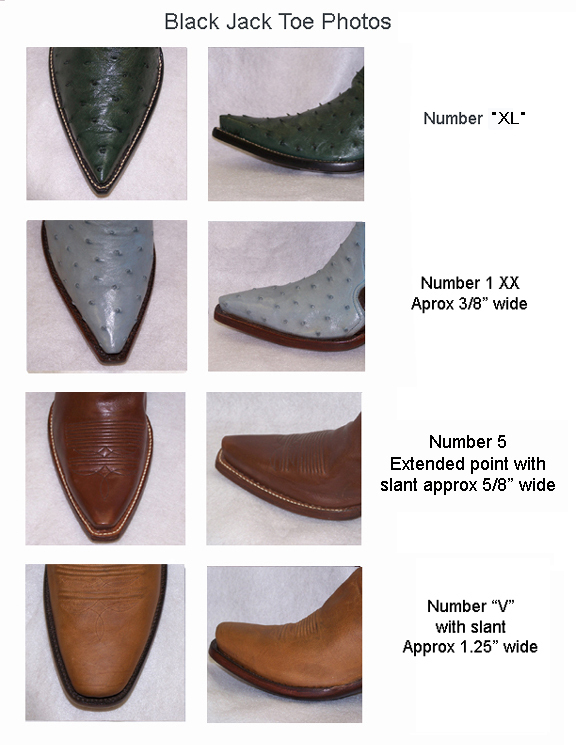 When you order a pointed toe cowboy boot, there is no need to change your boot size since the brand takes the room requirements for the pointed toe into account. There is, in most cases, no reason to order up a size. ROUND TOE: Round toe boots are very comfortable, as they allow the toes a little more room to spread out. 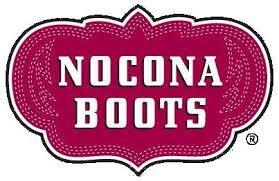 Many western work boots come with round toes, as do “ropers,” the popular boot for rodeo calf-ropers. This toe shape is generally not ideal for riding long distances, but is a great choice for a walking boot or casual boot. SQUARE TOE: A square toe is generally a fashion statement. 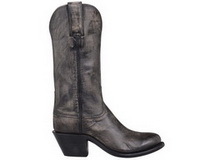 This fresh, young take on the classic cowboy boot has surged in popularity over the past few years. 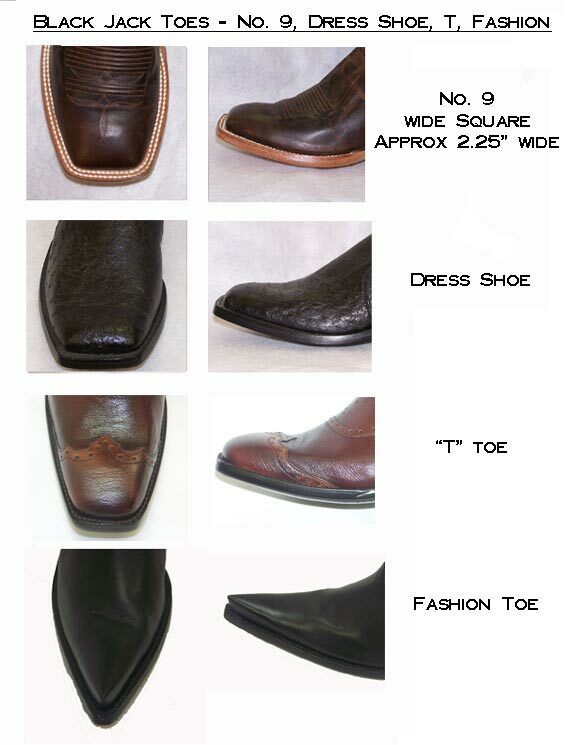 A Square toe can be found on riding boots and walking boots and is a great alternative to the more traditional styles. 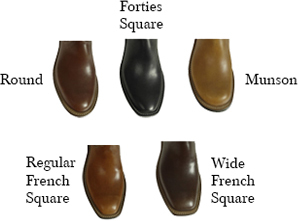 BROAD SQUARE TOE: Broad square toes are shown on some of the best-selling boots on the market today. A broad square toe gives the toes the most room to spread out, making boots with this shape an excellent footwear choice for people who are on their feet all day. Ariat Ramblers and several models of Ariat Fatbaby Boots both feature a broad square toe. 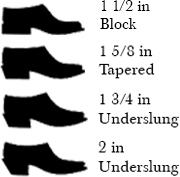 TOE SPRING: Toe spring is the upward curvature of the end of the toe box of a shoe. It is much more pronounced in a traditional rigid-soled running shoe than in a minimalist shoe. You want the toes (especially the large toe) to bend. It is critical for the large toe to bend on toe-off to activate the windlass mechanism and stabilize the foot. 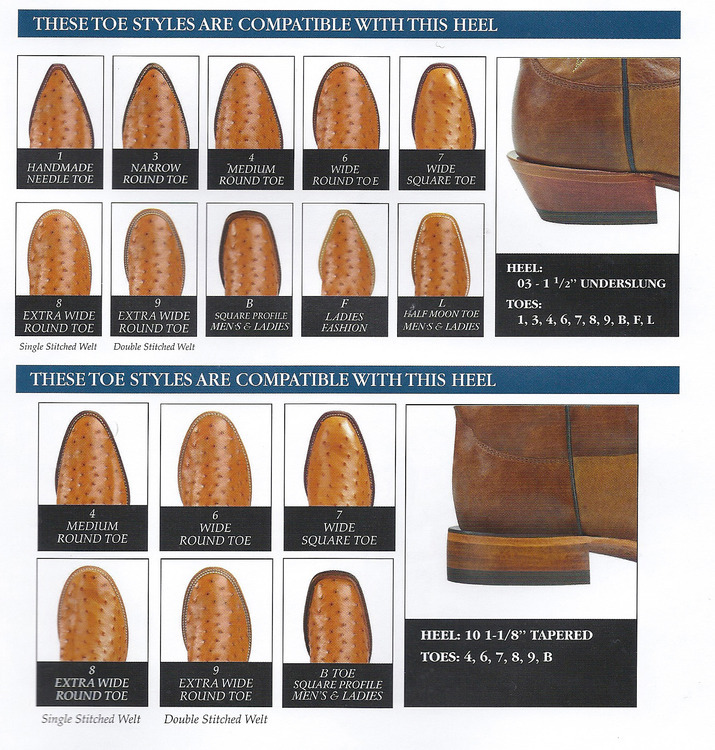 Western boot heel height is largely based on wearer preference, but there are some practical considerations when selecting your ideal Western boot heel height. Lower heels (around one inch) are usually found in ropers and are easiest to walk or work in; higher heels (around two inches) are best for riding… or looking taller! A middle heel height is the most versatile Western boot heel for a combination of riding, walking and working that many cowboys favor. You should buy only boots with authentic stacked leather heels if you want a genuine and durable pair of Western boots. You may want a rubber-capped heel for traction, and you should opt for a lower heel than the traditional two-inch riding heel unless you’re a frequent rider. 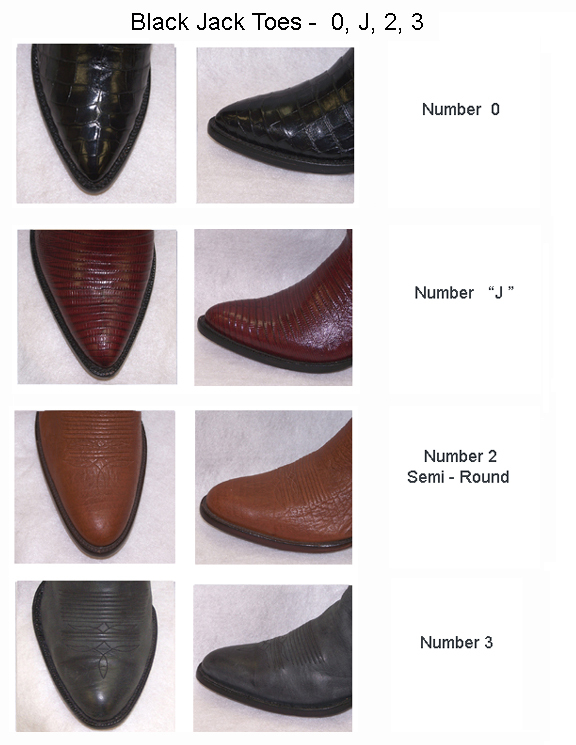 Standard Heel: The most common cowboy boot heel height is a medium size heel, which is also referred to as the standard heel height. 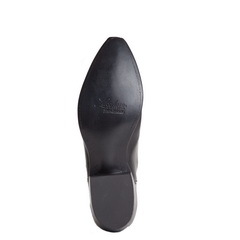 The medium heel is 1 1/2-inches in height with a wide flat bottom for good balance. 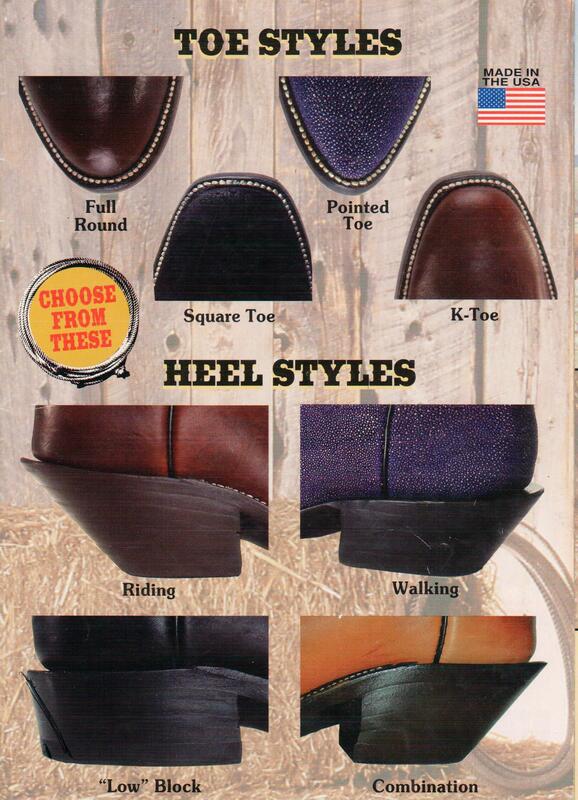 Most cowboys find this heel ideal for walking, riding, and doing other activities such as working on a ranch, or riding in a rodeo. 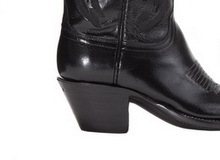 Low Heel: There are also shorter heel cowboy boots. These also have wide, flat bottoms but are 1-inch or less in height. Individuals involved in roping events more commonly wear boots with a low heel, since these are easier to run and maneuver in. Not surprisingly, this brand of cowboy boot is known as the Roper. The Roper style is also acceptable for general walking and ranch work. High Heel: The 2-inch or higher cowboy boot heel is not as common. 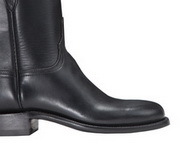 This heel is mostly employed by an individual specifically wanting to add to his or her overall height while wearing the boots. 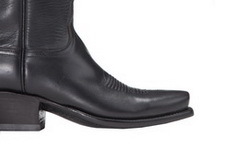 This type of heel can be worn when riding but are not ideal for working in. The high heel style still have the wide, flat bottom. Spiked Heel: This type of cowboy boot is commonly known as a fashion boot as they are for fashion purposes only. These heels are 3 to 4-inches in high and so add to a the wearer's overall height. Unlike other cowboy boot heels that feature a flat, wide bottom, the spiked heel has a relatively narrow bottom as their name implies. Twisted X boots are cut generously in size. 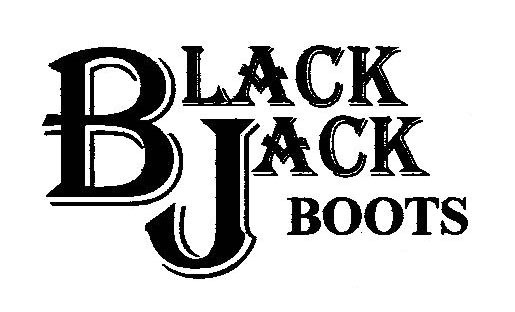 The boots are high quality cowboy boots, which means you'll have to work to get them on, then once your foot is in place, it should feel extremely comfortable. Your arch should feel supported. Fitting in Twisted X boots is consistent from boot to boot, so if you already know what size you wear, you'll fit it across the line. Twisted X's fit is comparable to Ariat boots, yet are not as full as Justin boots. 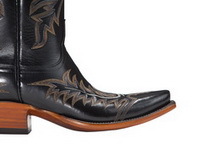 Lucchese boots feature traditional leather soles, which are flexible and breathable. maintaining the integrity of the hand-lasted instep fit. “Classic work boot”- The round toe boot has a tip that is rounded, versus flat. 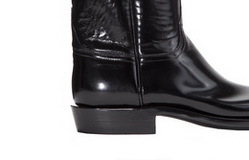 A round toe boot could be semi-round, full round (U-toe) or broad round. Each may be a little wider and less tapered than the other. 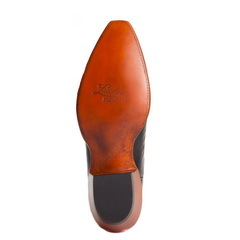 Western Square – lower profile toe built for work or dress. In a Square Toe boot, the front of the toe is flat, with the corners almost at a right-angle. The fashion toe boot is a J toe boot that has a bit more room for the toes to wiggle around, making it less-tapered and a bit more rounded at the tip. The snip toe is similar to the square toe, except the front is narrower. 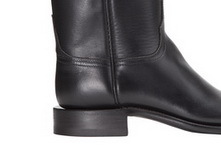 The boot is tapered to a near-point, but flat at the front.